We are SO excited to be a part of the 2012 Hero Arts Catalog Bloghop today – and we hope you’re getting excited about the new line coming out! If you haven’t hopped along to get here from Cristina’s blog, then go to the top of the hop, you won’t want to miss one blog! Operation Write Home is especially excited…because not one, not two, but THREE of the new clear stamp sets are a brand new partnership between HA and OWH! We suggested some concepts, some doodles, and some sentiments….and oh wow did the designers ROCK the stamp sets. You are going to want neeeeeed to pick them all up! Come back here tomorrow for our weekend vlog, and we’ll give you some of the backstory about how this wonderful partnership came to be. If you’re new to Operation Write Home – we’re a nonprofit that has sent over a million blank handmade cards to deployed heroes so they can keep in touch with their families. Visit our website to see all the project details—come join us! Hero Arts is giving away five prize packs – chosen from ALL of the blog hop comments received by midnight December 12th – leave some love on all the blogs to increase your chances to WIN! Our blog team has some sneak peeks for you at the stamps—all three sets are fabulous!! Paula has rocked the Year Round Sentiments set (CL582) – this one has a LOT of sentiments, as well as some awesome stars and hearts! Paula added more to it – embossing (Provocraft Script embossing folder), and some ribbon and SHINE! 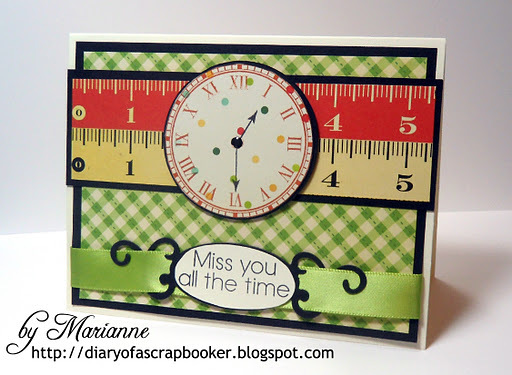 Marianne is showing off All the Time (CL584) – another great set with a lot of sentiments, including one of our heroes’ favorites – Miss You All the Time! Papers are by Cosmo Cricket, Material Girl and Garden Variety; Spellbinders’ Fancy Tag, and Marianne cut her circle on her Cricut using the George Cartridge. Barb is also using the same set, All the Time (CL584) – and showing you the other clock included in the set; it’s a little smaller and has a detailed border. Barb used We R Memory Keepers papers, and Spellbinders to diecut the heart and star, and wrapped it all up in some yummy bakers twine. 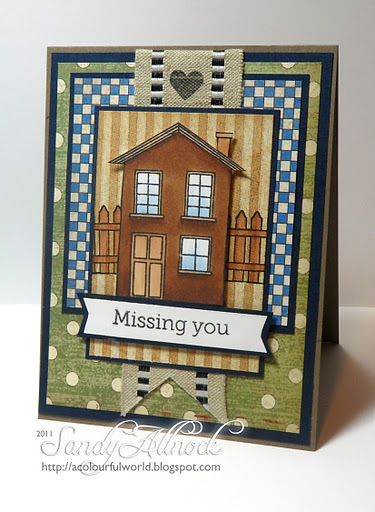 Sandy’s made a card today using Right at Home (CL583) – a house, fence, and other images and sentiments that our heroes will love to send home – and even some that families at home will love to send overseas to their deployed loved one! On this card, it’s all Graphic 45 designer papers, the ribbon is by May Arts, and the image is colored with Copic Markers. Yolanda’s card really shows off the all-day-long aspect of All the Time (CL584) – and pointing out that our heroes are missing their loved ones around the clock! How clever! Your next stop on the hop is Kelly Goree – oh my you are going to be inspired! Don’t stop hopping! Remember, if you find a link that doesn’t work, you can always hop back to the Hero Arts Blog for a list of direct links to all the blogs in the hop. Great cards & great stamp set. Can't wait to see the whole thing. These are lovely cards and such beautiful creations. Thanks for sharing your ideas! awesome cards! can't wait to get my hands on some of my own! These are really nice cards. So looking forward to seeing the OWH stamps that Hero Arts has so kindly produced. Cool clocks! Love to get my ink on them. How cool! Love the cards! Great cards using these new stamps! Terrific cards and loving the new stamps. Great cards! Wonderful organization! Keep up the great work! Wow! Terrific cards and sentiments! Thanks for the work you do! Anxiously anticipating the release of these stamp sets. Such outstanding cards to tell those that we care about that are over there how much we love and miss them. Fabulous cards I cant wait to these stamps reach the UK. All the cards were amazing! Thanks OWH for all you do. Thanks HA for partnering up with them. great cards! love these stamps. What a stroke of genius that Hero Arts and you have collaborated on some stamp designs! Love your samples today, especially the one with the picket fence! I love these cards. I am a veteran myself and you will never know how much these kinds of cards from home are appreciated. These are the best on the hop for me so far. Love them all. Awesome cards- all of them are very creative. Love the Year Round Sentiments! So useful for "just because" cards! Thanks. Great use for the new stamps, keep up the great work!! Great cards! Love all the stamps that were used! Can't wait for tomorrow's stamp party at my LSS — I NEED those sentiment stamps! I love all these great cards! Great cards! Can't wait to see the full sets! awesome fun cards…thanks for sharing..
What a great bunch of cards! The clock image is pretty darn cool. What a wonderful idea to have the two of you teaming up! Love these new sets – so perfect for our troops! Awesome, awesome cards! Thanks for what you are doing! Great cards for a great cause. I gotta see if there's something like this for our Canadian Troops. Beautiful cards. Love the one with the foil star in the back as well as all the clocks and the one with the house….I like them all! Thanks for all the work you do for our military! great cards and stamps!! tfs! Love seeing so many neat ideas and getting to preview the stamps. Great stamps and great cards. Thanks! Love these cards and beautiful showcasing of the Hero Art stamps! Waw, there are some truly beautiful cards showcased here! I love this new release. Very cool card! TFS! love your techniques! I love your cards! I love the clocks! Thank you for sharing! Wicked fun! I'm excited to hear the backstory tomorrow! I'll be tuning in! Terrific ideas for Hero x 2 cards gals! WOW Such wonderful cards by all the ladies!!! Thanks for the wonderful inspiration with the new Hero Arts stamps!! thanks for sharing some neat ideas! Very nice cards. Thanks for sharing! Love the cards! And the cause! These are awesome cards and I am so excited to see them here! I just want to thank you all for being there for our troups and everything you do. I recently won the set from the Veterans Day blog hop but haven't seen them yet. They won't send them until after the release so this is a double sneak peak for me. Can't wait to receive them and make some cards to send you guys. And now I have some great ideas on how to use them! Thanks again. Super cards and great inspiration!God bless what you do! Nice cards, thanks for all this ispiration! fabulous cards! love, love, love the clocks!!! great use for them! Wow…love the miss you all the time set….can't wait to see it in full. Merry Christmas! Wonderful cards! I can't pick a favorite..great addition(s) to the Blog Hop! so many cards, loved seeing your projects! Great cards, especially like Marianne's. lots of good ideas and samples. Lovely cards. Really, really cool cards! Love them all! These cards are just beautiful. Brings tears to the eyes. Beautiful cards and perfect for our heroes and their families. Wow lots of stamping goodness! Love all of the cards! Beeautiful cards! My wishlist is growing!! If it wasn't for the Blog Hop, I wouldn't have known about Operation Write Home…awesome site AND awesome cards! I love these cards. This is my intro to your site and I'm so glad I found it. I will be back. I love these cards — they're all so bright and have so much color and texture. I'm happy to have found your blog through the hop! Great website !! Thanks for all you do for the troops. I am a volunteer at Central PA Supports the Troops. Keep up the good work. Great card ideas. love love LOVE them all! Great job on the cards for sure! I'm a new visitor to your site. What wonderful mission! So many great ideas. I look forward to joining you. Love your organization and what you team does. You're really heroes in my heart. These cards and the stamp sets are wonderful, aren't they? You ladies have out done yourselves again. Great cards!Welcome to the new people who have just found OWH. We hope you join us in this wonderful mission! !Nanette V.
I just love anything with clocks, so I'm really looking forward to this set. Love these cards. Great way to show the clocks in a different way. Love them all. What cute cards, perfect for OWH!! These cards are just gorgeous!! Beautiful display of cards and talent. Thanks so much for all you do for our troops. Will be bookmarking your site to find out further how our group can contribute to your cause. Lovin' all the new Hero Arts stamps showcased here too! Just love those clocks! great job ladies! You guys do wonderful work! I'm going to be making cards for you in the very near future.Love the creativity of all the cards…so perfect for our heros! Awesome cards.. thanks so much for all you do. I love this clock. Adding it to a wish list. Great cards and I so love these stamps! Beautiful cards! Can't wait to get these new stamps! These are awesome cards! I especially like the one using the "Right at Home" stamp. Thank you for your service to our "heroes"! What beautiful cards! Thank you so much for being a part of the blog hop!! I can't wait to see these stamps and use them! This is a great sight with great card ideas! Oh, what a beautiful inspiration! Love…. Cool cards! Love the stars! What wonderful cards. Thank you! Beautiful cards!! I love the clock stamp!! All so fun! Great use of the clocks and stars! All the cards are incredible! Can't wait to buy the new stamps! That is SO COOL that HA and OWH are in cahoots. Love it. Great cards peeps! what a great collaboration, I am going to need these stamps! Beautiful cards, each one of them! Nice selection of cards made with the different stamp sets! Oh gosh, I love your color combinations. And the clock/time stamps are so cool! How fabulous! OWH and HA — what a great pairing. Just love your card stamples. Thanks for the chance to win. What a great bunch of cards–thanks for what you do–you really make a difference. Our cardmakers totally rock! The stamp sets look like they will be terrific for us! Thanks to everyone for sharing their cards and ideas. Wow, fabulous cards, all!! I love those sentiments and the images are perfect for them! my fave is yolanda's card. i'm feeling the vintage stuff right now, so that card really vibes with me. love the colors too! WHOA Nellie!! These are gonna be SO much fun–(but why, oh why, do we have to wait?! More of the big tease; OK, I'm getting used to it, Sandy–you big teaser!) Very inspiring cards, ladies; TFS! Thank you Operation Write Home for all you do for our service men & women! Your cards are awesome and so inspiring – to not ony create but to participate in your cause. Thank you for the inspiration!! I love the clocks and the hearts and stars. gorgeous cards girls! I love Sandy's with the house, so sweet! Wow! I can't wait to learn more. Cute cards. all these cards are awesome! i think they showcase the new stamps wonderfully! great job! Great cards! Nice to see something other than the Zig Zag backgrounder (not that it isn't very cute). Thanks for sharing. great cards and what a wonderful partnership to have been established. wow, what a fabulous collaboration for a good cause, the cards are marvelous, and i am sure our troops will love sending and receiving them!!! Thanks for all the great work you do for our heroes!!! Great cards & I like that you have different stamps from the rest of what I've seen on the hop. Thanks for the inspiration!! These are all wonderful cards! Your collaboration with HA has led to some wonderful images and sentiments. Thank you. Thank you for sharing your wonderful cards! Awesome to hear that you are partnering with Hero Arts! What great cards, Thank you! I love the cards that you have featured today… and many thanks for the support you give our troops. These are fabulous cards! Such inspiration! Thanks so much for the chance to win! wonderful showcase of the new stamps! thanks for the inspiration! What a fantastic array of cards! I love them all, especially the clocks! Beautiful all around. I can't wait to see the whole line! I love the new stamps, what an exciting giveaway! Such great ideas…thanks so much! Just want to say thank you to OWH for giving of blank cards to service men and women around the world to send to their love ones. How wonderful and am sure it brightens someones day when receiving such cards. The cards above are so nice and elegant. All those stars, hearts, will make someone smile for sure. Happy Holidays to you and yours. Great cards, great cause, great prizes! Life is good! Fantastic cards. Glad I don't have to pick a fav! Wonderful news about your partnership with Hero Arts and love the concepts and projects using those stamp sets. Thanks for the inspiration. Wow, love these cards – they are so touching and so well deserved for our servicemen and women. Love the cards and the cause! Oh wow, these new stamps are so perfect…loving all the inspiration from your team! You have shown us some wonderful cards for such a worthy cause. Thank you and I am glad that I found this blog. What a great site this is! And I would love to win the new Hero Arts stamps! Love the stars! Congrats on the partnerships! Such great cards and perfect for OWH! I often read the comments of the soldiers who got a package from OWH. They make me smile every time! These stamps are perfect for OWH!! So wonderful! Glad that OWH is part of the HA blog hop! Oh the All The Time sets looks just like something I need! All the cards are lovely! Great ideas for the troops! Such great cards! Can't wait to use them! Great cards, so many ideas for using these stamps. I love for use of color. The cards are cheery and fun! Great cards, great stamps, great company, great cause. Wow, wonderful cards and great stamps–the perfect combo! Thanks for sharing. These are fabulous! !everyone did a great job! Wonderful cards. Perfect sentiments and what a great organization. Love what you're doing! Gorgeous cards, and how cool to see the partnership between y'all and Hero Arts! How does Hero Arts keep coming out with my favorite shapes? I've always loved stars – on quilts, in die cuts and in rubber stamps. These cards with stars just work for me! Hero Arts rocks with the clocks! Truly loved all the cards. The Right at Home set looks like a must have set. Who doesn't love hearts and stars…and those clocks are great for counting down deployment days! Well done! Love the stamp saying, "miss you all the time" and what you've done with it. Great inspiration. Wonderful card samples. Thanks for the inspiration! Love the time theme! Awesome new release! i like them all. OWH is a great idea. who wouldn't want to send or receive these cards. What a great use of the clock stamp! Awesome partnership!!! Love the cards. So inspired! Wonderful cards and a great cause. Thanks for all you do. All great cards. The clocks are fabby. Love the cards. My favorite is the missing you all the time card. Thanks. What a great blog you have and for such a great cause. I just love Hero Arts. Happy Holidays! Adorable cards, great versatility too! So mcuh creativity going on! Wow Ladies!! You all rock! What fabulous cards! I can't wait to get these sets!! Thanks very much for sharing all of these gorgeous cards with us! Also, thanks so much for a chance to win! Great cards! Perfect set for a nice thank you to the troops! These cards are great! I cant wait till the new stamps come out. Wonderful creations, ladies, with the fabulous new stamps!! Beautiful cards! Such a great cause. Congrats on partnering with Hero Arts! Love the work you do-the cards and the organization! What a great set of cards. I love them all. Thank you for letting me participate. These are all such wonderful cards and and created with such a wonderful cause in mind! Wonderful cards and an amazing organization. All of them are so cute, but my favorite is the clock/ruler card. Adoreable. The right at home card has such a cozy feeling-love it! First time on the operation write home page, Hero arts blog hop brought me here. I definately plan on coming back to get more details on how this work, seems like a wonderful project. Thank you for sharing! Love that clock set-that is too cute! Thanks for the inspiration guys!! All your cards are just wonderful. I'm on pins and needles for these newimages. Love the starsc card-what a pop of color! They are all super! Thanks for sharing! Great ideas for those stamps! What wonderful sentiments for soldiers and their loved ones! These cards really show so many wonderful ways to use the designs, too! TFS! rgauss at sbcglobal dot net. I always like stopping here. I discovered this wonderful cause through the HA blog! Gorgeous cards! The new stamps are great! Love the clocks and the awesome ways the cardmakers used them. Love love love your cards…and also love the work you do. I will be back to donate some time to you, if that is okay?Just love the clock cards. So glad to hear of the partnership with OWH and Hero Arts! These stamps are certainly timely and much needed. Thank you for the work you do!! What a great thing you all are doing. Amazed by the creativity! These are all such great cards! So much inspiration here! Great cards from a very talented team. Thanks for sharing. Love all the new stamps I have seen along this hop, including the ones your team has used for their cards! Thanks for all the inspiration. wow! I knew nothing about your mission. You are fantastic, loving people. Thank you for your service. I really enjoy all the variety of your cards using the stamps. REally can't wait to see that catalog! I love all of the cards and I love the concept of OWH. WOW so many amazing new stamps and great projects you shared here!! Way to go Ladies – fantastic cards. Love all the work and creativity you put into them. These are beautiful. Such a great cause. TFS. Love the Missing You card by Sandy. I have made and sent quite a few cards to you. I loved spending time with my friends making cards to send to you. Stunning cards! I love the clock set. Thanks Hero Arts for a chance to win some new products! Just love all the cards! Looking forward to seeing all the OWH Hero Arts stamps and hearing the backstory. Thanks for the great work you do! Gorgeous cards! Love the colors and layouts. I adore the new stamps! can't wait to see the whole catalog! So many great ideas! They are making me really excited to see the new catalog! !Merry Christmas & a Crafty New Year!! What great cards made for a great cause! How nice of HA to listen to your requests! Very fun projects! Can't wait to see the stamps! What great suggestions for stamps! Love the cards. Love the new HA stamps. And LOVE what you are doing for the families that are separated. Fantastic cards and what a wonderful organisation. Wow, what awesome card makers you girls are!!! Great creativity! Gorgeous inspiring cards. Thank you! Awesome, love that new home stamp. Like all of the cards that have been created by the blog team.The one with 'miss you all the time' I like the most. Great cards, love the stamps. Fantastic cards and must have stamp sets! What a great collaboration between HA and OWH! The cards you've shown today are wonderful and very inspirational to those of us sending cards to our loved ones in the military! You have great cards out here! Thanks for all that you do for our troops! You all are amazing! Great cards! I really like the patriotic one! This hop is awesome! So much inspiration! Beautiful job on theses cards! Love the new stamp sets! They're so versatile. Thank my lucky stars is a favourite! Great site. I am happy to say that my card-making group uses Hero Arts stamps and participates in the "operation" by making cards for the miliary at our meeting each August. Fabulous Cards.love the stars in the first card and the different uses of the clocks. Way to go OWH and HA for this great partnership! I love the stamps, all of them. My favorite card is Yolanda's because the clocks remind me of the multiple clocks often used in the military to keep track of time zones. So smart! Your designers have done a wonderful job showcasing these great stamps from Hero Arts. So glad there will be these type of sentiments available. I can't wait to get my hands on these stamp sets!! Yippeeeee! great cards, all … and I'm lovin' all the stars in the "lucky stars" card! thanx for the inspiration and blog candy opp! Thanks for the chance to win. Love the new products. Great cards. Thanks for the preview of the new stamps. Crazy for the clocks! Great cards and sentiments…what a great partnerhip between Hero Arts and Operation Write Home! All these cards are wonderful, great colors. Loving all the cards and the stamps! Hoppin' along!! What great cards from great stamp sets! Thank you HA for including OWH on your blog hop – I had never heard of them and am very intersted. A great way to share our hobby. Those clocks are awfully cute! Thanks for sharing, I am feeling inspired! Great cards, great job with OWH! Great cards ladies! Thanks for sharing. All fabulous cards for such a great cause! Congrats! Love looking at the cards that are created here. These are so fun and what a great partnership! Wonderful cards! I can't wait to purchase these stamps!… I know what will be at the top of my list! You're very talented! Get cards! Really great cards. My wishlist is getting longer. OWH definitely pays it forward. Truly an inspirational idea to send cards to let our troops know we care. clocks – what a great use for your website's purposes – we do miss our friends deployed overseas! Looks like a great partnership. Can't wait to see the full sets of stamps. FANTASTIC cards and this stamp set is awesome too!!! Awesome cards by your team! So digging all the excitement! Amazing cards made by people who support an AMAZING organization! Thanks for all you do! All the cards are so beautiful. I can't wait to see the new stamp sets in the LSS. I know they will be useful for my card making. Great use of the stamp set. Thanks for sharing! Thanks so much for showing the different sets with a variety of papers. Can't wait to use these stamps, especially the 'Right at Home'. Was delighted to hear of OWL and HA getting together; the designs that resulted are terrific. Great cards and a great organization. You have showed us that hearts can be used in other ways besides for Valentine's day. all the projects are wonderful!!! Thanks for a fun hop… lovin' all the new stamps I'm seeing. really great cards! love the time stamp sets. What wonderful collaboration! Hero Arts for our Heroes! Excellent inspiration for these awesome new sets! These are darling! I love the house card and stamp set! These are gorgeous! Love those new stamps! Your cards are terrific and a great inspiration. I recently learned about Operation Write Home and I'm so pleased to have some ideas for cards. Your creations are sure to delight their recipients.Thank you for sharing them! These are fun cards. Thanks for sharing! Beautiful cards! Your blog team did a fantastic job. Love the clocks and the 'miss you all the time' sentiment. As a former wife to a former sailor thank you for all you do. Waiting at home to hear from your loved one is not easy, and a card can really make your day, week, month! Love the simple cards and the great stamp sets ! Wonderful cards!! I esp love the clocks – there's something about clock faces that make a card so fun. Great ideas!! Fabulous cards and new stamp sets!! Can't wait to get hold of that house set. TFS! Great cards! These new stamps need to be in my collection! I know what time means for those who have come home injured or suffered an illness while deployed. Thanks for sharingvthose ideas. Love 'em!! Can't wait to get my hands on the new HA/OWH stamp sets tomorrow. I love what you do for our troops. Thanks for the great ideas! Fantastic cards! Love those clocks. It is wonderful all the different projects and styles that all you crafty people are coming up with! You guys run a great cause! Having spent a bit of time deployed in the 80's I can relate to how important mail is to the troops! Thanks for all you do! How exciting you partnered with HA. Great cards. The clocks work so well with missing someone. Thank you for all you do for our Military. I love the "miss you all the time" sentiment. It's just super cute paired up with the clocks! Gorgeous cards. Love all of them! Terrific cards!!!! wo wow love all of them .each of them have great style, the clock one is superb! Great cards.I can't wait to get these sets. WOW! those are all fabulous cards! Wow, you sure were productive. I love all yours cards, they are wonderful. I adore the "Thank your lucky stars……" card, that's a great sentiment. All of them are so cute and clever. Thank you for sharing and inspiring. Happy Holidays to you and yours. These cards are darling…and because they were made for the reasons they were…they are my favorites-Operation Write Home will get some of my charitable $ this year and my prayers, as well. I have lots of respect for your organization and what you team does. These cards and the stamp sets are wonderful. Great stamps and, IMHO, perfect for the OWH cards. Lovely cards, love this stamps. What fantastic cards – the recipients are going to love them! I love the clock card and all the new stamps. Thanks for sharing. Wonderful cards here. So love them all but the Right at Home card is calling my name to get those stamps now. Love the All The Time stamps as well. Great job everyone. TFS. WOW – these new stamps look GREAT! I think the year round sentiments set will be so versatile, and I really love the clocks. Thanks for the great inspiration. Great cards! I didn't know you guys participated in blogs. Thx so for all you do to get cards to our troops! What a great way to showcase the new releases…. Your cards are just beautiful. Thanks for sharing. I'm so glad your website was included in the hop! Thanks for sharing those beautiful cards! I love the Operation Write Home card. Perfect. Amazing cards – love them all. Thanks for the inspiration. Have such great respect for your operation, it's an amazing idea. Your cards are great ! So many fun examples, thanks for sharing them! These are ALL so great! Love those clocks a lot! I've heard about your organization, but this was the 1st time I've looked at anything online. It was a good idea to get involved with this blog hop. Fantastic cards!!! Love the clocks! Such a great idea! I love the new Hero Arts cards. Wonderful cards! I love the clocks and the sentiments that go with them. Love the clock stamp and the cards you created. beautiful masculine card…tx for sharing such an inspiring craft! I haven't been to your blog before, great ideas and for a wonderful reason! Thank you for sharing your ideas! Great cards a what a nice stamps. What a wonderful collaboration! Love the cards and the new stamps! these cards are so much fun!!!! These cards are fantastic! The one with the house is my favorite, so detailed and beautiful. Super cards!!! Love them all. WOW….Awesome Cards Love each one of them!!! Love the clocks and the sentiment! Awesome cards! These are all amazing. I love making cards for your organization. Great job! Fabulous cards! Love the large stars. 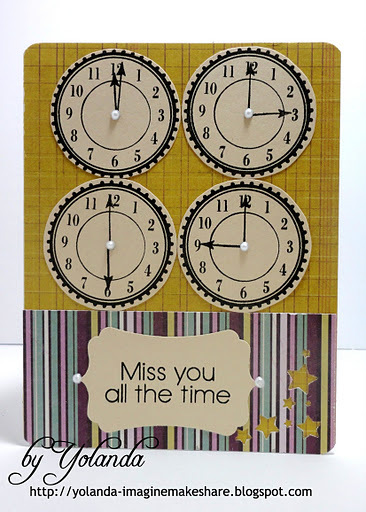 I love all the miss you clock cards. What a terrific pairing for a heartfelt card. Thanks for sharing! I never realized a clock could be used so many ways on a card. So clever! Such creative works of art. All these cards are AMAZING! Love the stamps! great stamps! congrats to OWH for getting linked up with Hero Arts. Such wonderful cards, and what a great match up, HA and OWH! The "Time" stamp is sooo my favorite! Thanks for all you do. Beautiful cards, love the stamps! Wonderful cards and Operation Write Home is a great organization, keep it up. uh oh I love this stamp set too! Wonderful cards, very talented ladies!! What lovely cards for a lovely cause. Thanks for the inspiration. What a wonderful partnership. Great company supporting a great cause! Love it. Great cards & great stamp set, and the chance to win. I love clocks! How fun to see them on cards, too! Wow! What amazing cards using these great stamps!!! I love the first one the best, but they are all great! Thanks for sharing! Wow! I'm heading to the beginning of the hop, but need to let you know right away what great elements these new stamps have. If these cards are any indication, this collaboration is going to be a HUGE success for everyone involved. What a wonderful idea to team up! Love the new sentiments, great cards ladies!!! I love this hopping. So many great ideas. Beautiful cards and what a wonderful cause! Great cards. Thanks for sharing.Linda D.
these are all wonderful! TFS! That first red, white and blue card is PERFECT for the theme and occasion- love it! Love these new Hero Arts stamps- so many great sets to choose from! What a wonderful thing all of you are doing…every single card is special in their own way…lovely amazing work girls…thanks for sharing! More wonderful stamps from Hero Arts as always! Lovely cards! My favorite is the house card, but also the clock cards! All of these cards are simply fabulous! Such a creative team & spirit too! So fitting that HERO Arts are producing these stamps for OWH as are military men and women are the true heroes. Kudos to you, Hero Arts for your creation of these wonderful stamps! LOVING these new stamps!!! And I love your idea of sending blank cards to the troops!!! Cute Cards! Oh boy, more stamps, inks and a new catalog! All of which I would really love to have. Thanks for the opportunity to win. These are all terrific cards! Very nice cards! Love the variety. Stunning cards. Love the black outlining. Graet cards for an awesome cause! Good work on all the cards! Wow! Great creations and I love the mission of your organization! Kudos to you all! These cards are all great! So glad to see that HA has created stamps that are just perfect for Operation Write Home! Wonderful cards with great new stamps. I love the stars and the clock faces. Love all the cards you made and thank you for all you do for "our" heroes!!Katinakjkoukla(athotmail…. Love your cards – and your mission! I really like the lucky stars card. Great work. Love all your cards but that clock one really makes a statement! Super cute! Beautiful cards – love the colour combos and the stamp sets!! Love this set of stamps and your creation. Thanks for sharing. Great cards! Am enjoying seeing all the new stamps. Bet the troops would be really pleased to receive these cards to send to friends and family. All really wonderful cards! You have made the subject matter more cheerful! Thanks for sharing!Katie B.
great cards using the new stamps and what a great thing that OWH does! So many ways to use these gorgeous stamps. Love all your beautiful creations. Love the clocks! Great cards. Great cards! Loving those new stamp sets and what all of you did with them! Wow what wonderful cards! Love how you've all used the new Hero Arts stamps! Great ideas and good use of the new stamps – can´t wait to seethem in real…. Wonderful cards and an even more wonderful outreach! Great cards. I love the clock stamps.Such a worthy cause. Wonderful ideas to show others you are thinking of them. Great job that you do. Will look for your stamp sets. Lots of veterans in my family so I appreciate all your efforts. Beautiful cards! I love how versatile the sentiments can be. What a great thing to do. May God bless our troops and keep them safe!! Merry Christmas! Very nice cards! Thanks for the inspiration!! what great sets! and Operation Write Home does such a great thing, love you guys ! AND Hero Arts…off to buy stamps! Clearly a nice display .. Your cards are lovely. Great cards! I may need to case these! Thanks! Just found your blog. What a great idea! And stamps to go with. Your partnership with HA is a An awesome one. Great stamps! As a wife of a retired service member. Thank you. I know how much the soldiers appreciate this! Beautiful and meaningful cards! Really great for OWH! Great that Hero Arts have some stamps for OWH! Such great ideas – fantastic cards! Beautiful cards! The clock stamp is gorgeous!! Great collection of cards. Congrats on the collaboration with HA. OPERATION WRITE HOME…What a FABULOUS idea! so awesome that you have teamed up with HA! Great cards! Thank you for sharing! Love them all!! I love the stamps that were designed with OWH. I think it's an amazing thing you do and you can bet that I will be ordering these sets. thanks so much for your efforts in bringing joy the heroes of our day…beautiful cards displayed here to remind all we didn't get here by ourselves only! What wonderful cards…and the peeks of the new sets make me want to run out and see them in person! I have been really enjoying this Blog Hop – so much inspiration and ideas I want to CASE! Love these cards & can hardly wait to get my stamps and play! So happy for the affiliation between OWH and Hero Arts & these stamps are wonderful! Love what I am seeing int hat All The Time set! Gorgeous cards. Thanks for sharing such a wide variety of cards! So gald to hear about the partership of OWH and Hero Arts. The new designs are perfect. Thanks for your samples–lovely. So happy you were part of the blog hop, very nice cards. Great cards. Great stamps for all year round. so excited about the Hero partnership! I do love the clocks and the sentiments are perfect! Amazing cards! The new stamps look great! Great Cards, Especially Paula! I really like the Red, White, and Blue. Beautiful work by all the designers. Glad to see Hero Arts partnering up with such a great cause. Makes perfect sense! 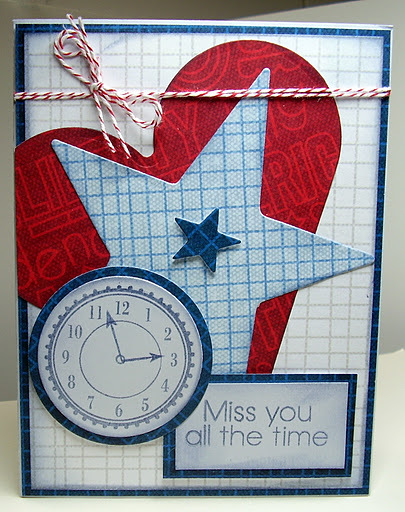 Love the clock with the "miss you all the time" stamp – wish that had been issued when my husband was deployed . . . love the Hero Arts/OWH stamps! Thank you for sharing. These are all lovely and definitely priceless for those who will be receiving it. Great cards and stamps! Thanks for sharing! Such talent ladies! Great cards and gorgeous colours! Well done! Hand made cards seem more personal. I have sent some cards to my brother at the VA Hospital and to the staff who have taken such good care of him. Love the way these sets were used…. such a great cause too! Wow! Awesome cards!Thanks for sharing. The new HA stamps are fab! Esp love the newsprint ones! Your cards are great. I've never been to your blog before. It's a wonderful thing that you do. Love all of the stamps and the designs! And thank you for your organization, too! Beautiful cards. I love the clock stamp set. Love the stamps..and the card samples are just amazingly gorgeous!! Love them !! Fabulous cards using these new stamps! WOW WOW And WOW! Wonderful projects! What wonderful uses of the stamp sets! I love what you all did thank you so much for sharing your creations! thanks for sharing, beautiful cards! Oh, I love the stars and Right at Home cards! How wonderful! I love all the cards. It was great to see so many samples using different stamps. Great cards! So much inspiration to draw on but I am even more excited about the new partnership. A great decision by HA!!!! wow..what great cards! Thanks for sharing. Obviously these are wonderful stamps because and your designer did a beautiful job showcasing them. Love these cards. Beautiful cards! Keep up the good work. The "Miss you all the Time Card" is so beautiful. The colors are so inviting and warm. What great thing to do. Love all the clock cards. Great idea. Thank you for sharing your cards and great ideas! Great Cards! Love the new stamp sets! Great cards … thanks for sharing. Plus it was wonderful to find out more about your nonprofit. I had heard about it previously but now I feel I know what it's about. Hope to support it in the future. Wonderful cards. I am in love with ALL those clocks. These cards were so appropriate for OWH. I'll be back. Fabulous cards and for such a great cause! I love these cards and all the new stamps! I definitely neeeeed all of them – lol! OWH has some of the best card makers! Excellent cards ladies! Wonderful cards and sentiments. I'm thrilled with your partnership with HA. Love the stamps!